The birds are prepped to fight by having a blade tied to one of their feet with string. 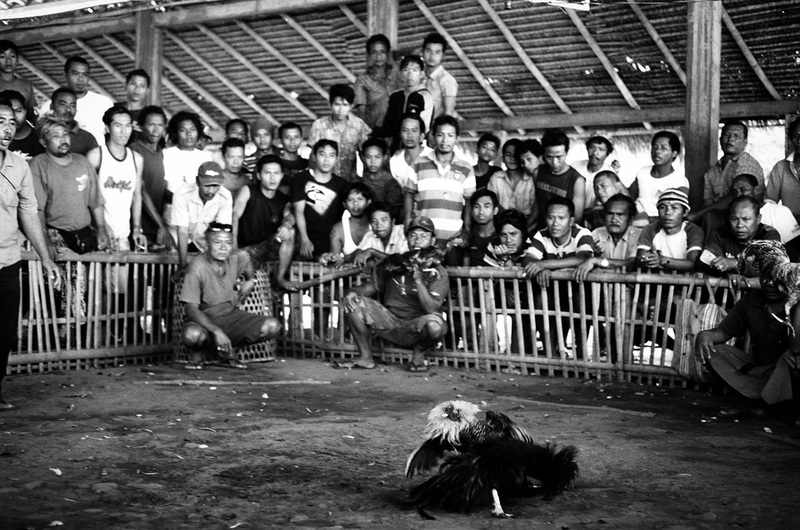 Once the birds are ready to fight, they are placed face to face by their handlers. The spectators then begin chanting and placing bets on their favorite fighter. As a man collects money for bets, the handlers begin to agitate the birds and ruffle their feathers which make the birds anxious to fight. Once the birds begin to fight the men watch intently and cheer for their fighter to win. One bird delivers a severe strike on it's opponent as the men watch. After every fight the wounded birds are killed, plucked and then distributed for meat. A pile of feathers and other bird parts have formed just outside of the fighting area as a result of the daily tradition.